Health Information Management. Photo courtesy of Shutterstock. Pursuing a health information management degree is ideal if you are looking to pursue a career in the healthcare industry. The degree can prepare graduates to become well versed in health data management, health information services, and health information management. It is an excellent field to pursue if you like the idea of working in the healthcare industry but are not inclined to work directly with people. Graduates are qualified to seek employment in numerous levels of healthcare and may interact with numerous other healthcare professions. Your education can lead to an excellent career, which can be far more than just a paycheck. The following five reasons are why many have chosen to pursue a health information management degree. Many healthcare professionals earn a good salary. With more experience and training, they can advance in their field and even realize greater benefits. Job security is important in today’s volatile work environment. Unlike other industries, the healthcare industry is growing rapidly and is in constant need of new people. Millions of baby boomers have come of age and require growing medical attention. There are always job openings created by others who have retired as well. There is nothing better than the feeling of knowing that others can benefit from your professional expertise. Healthcare careers span from working in a doctor’s office to running a hospital. Careers are often limited only be a person’s experience, training, and imagination. Another great benefit of pursuing a career in health information management is that job prospects span the country. Across the Unities States, there is a healthy demand for industry professionals in a wide range of fields. It makes it easy for industry professionals to choose where they live and work. 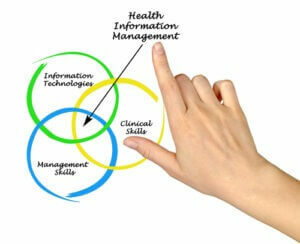 The first step in preparing for a career in this field is to attend a health information management school. While programs may vary by school, location and degree level, the majority will expose students to studies in healthcare financial management, health data, healthcare outcomes and quality management, health information systems, and health information management. One of the biggest benefits that healthcare practitioners can realize is the ability to make a difference in people’s lives. They possess the knowledge and skills to help make the world a healthier and safer place.